A 3-point lead at that point of the game would give the Lions a 0.62 WP. A 4-point lead would give them a 0.66 WP. And a 5-point lead would give them a 0.69 WP. Assuming the Lions' chances of success with the 2-point conversion isn't too far off from the league average (48%), the total expected value of going for 2 would be just over 0.65 WP. So head coach Jim Schwartz needed to have confidence enough that Suh had an 86% chance of making the extra point. ...But, I suspect part of the marginal benefit of the 5-point lead over a 4-point lead is due to the fact that one more FG could put your team up by 8, which either puts the game out of reach of a single touchdown or forces the opponent to go for 2 points to tie. With the kicker injured, this is not likely. Any more scoring by the Lions would have to be by touchdown. That's really going to affect all the WP numbers, not just for the 5-point number. But as a quick-and-dirty estimate, let's assume that the value of the 5-point lead is the same as for the 4-point lead. In that case, Schwartz would only need to have a 48% confidence level in Suh's leg--the same as the 2-pt conversion probability. Oh, almost forgot. The Welker XP? Didn't matter. I recently had this idea, which I'd love to see some non-traditional coach try out: If my own time spent messing around on a football field is any indication, there's no overwhelming skill involved in kicking field goals of, say, 30 yards or less. That's not to say it's easy, as Suh demonstrated, but it's not like he spends a whole lot of time working on his kicking, either. So what if you take somebody like (because I'm a Falcons fan) Eric Weems—above-average kick returner, third-string receiver, basically a good athlete who's not on the field a whole lot—and make him the short-yardage placekicker. He'd handle extra points and field goals of 30 yards or less, and you'd have all kinds of options if you ever want to do a fake. Sort of like the Wildcat formation for field goals, I guess. I don't know, maybe that's too much risk just to set up the occasional fake (which probably wouldn't catch the defense as off-guard as it normally would), or maybe your regular kicker would lose accuracy due to the decreased reps, but it'd certainly be interesting to watch. I like it. All QBs should know how to punt too. Sammy Baugh approves of that viewpoint, Brian! Although I have to imagine a WP analysis would reveal that the surprise third down punts he occasionally pulled were a terrible idea. I suppose if he got a TON of yards on the bounce... maybe. what if you take ... basically a good athlete who's not on the field a whole lot—and make him the short-yardage placekicker. The reverse was done by the Jets Super Bowl team way back mid-last century (I'm dating myself). They had a super-accurate place kicker in Jim Turner but he his range stopped dead at 40 yards. So on kickoffs and long "prayer" FGs defensive Verlon Biggs did the booting. It shows how the game has changed. (I don't think Verlon was much of a threat to fake anything.) Just an historical oddity, maybe. All QBs should know how to punt too. Craig Morton was the last regular QB I remember who was a real threat to quick kick. I know that Bill Walsh said he'd have used the quick-kick if he'd had a QB who could punt, and that he regretted not putting in a Single Wing package for Steve Young. That was "defensive end Verlon Biggs", if anyone really cares. Sorry for the typo and this errata comment. I had a similar look at the Bills v Bears, when the Bills went up by 5. Assuming the XP was automatic, the Bills needed about a 64% chance of making the 2 pts to make it worth going for it. As it turned out it didn't make too much difference to the result, but if you assume nothing else changes then the Bills would have been driving for a FG to win rather than tie, making a big difference to their WP. "All QBs should know how to punt too." Big Ben use to punt a bit and I know the Steelers used to use him on quick kicks when it was 4th and not-a-lot inside the opponents half. The beauty of it is that it removes the risk of a deep return, so the 'quick kick' punt becomes more valuable than traditional punt. Also QBs should know how to kick a drop goal. Seems to me that if it's 4th and 3 and the QB doesn't like the defensive look he can jump back in shotgun and take 3 pts, and if he misses it's not a whole lot worse than a failed fourth down field position wise. I believe that kicking a ball (punt or FG) about 30 yards is much more difficult than we imagine. But it can be done on the first try, if the punter is sufficiently athletically gifted. One idea from rugby that I've always liked is that the player who scores the TD is the one who has to kick the XP. Punting, especially when you aren't concerned about hang time, isn't difficult at all. Also we're talking about football players who have been around the practice field for most their lives, I bet they've all tried punting at some point. Rice University ran quick kicks with some regularity with Chase Clement (now in the UFL) in 2008. The safest way was to move two TEs into the backfield while the QB drops back to shotgun, wait a beat to be set, then kick the ball. The defense won't have time to get a returner downfield and the wide receivers/gunners are unlikely to be blocked because the corner can't be sure it's not going to be a pass play. And that's the complicated way. You could just as easily punt straight out of shotgun with two backs to help block. But with so much time left in the game, there could still be multiple touchdowns and/or field goals scored by either team. No reason to assume 2 points is no better than 1 point. If the Bears score a TD and 2 FG's they are up either 8 or 9 - a dramatic difference. Or conversely, Buffalo could score another TD;then they are in the same boat. Even making one of the 2 2-pointers puts them in the same position as making both kicks and being up 11 is definitely better than being up 10. Bottom line - I think they should have gone for 2, unless they really thought Suh was almost as reliable as their regular kicker (well over 90%). "Now I understand why someone came up with the nickname Jim. (and Jimmy and Jimbo or J-Dog, etc...)"
Yeah, I know. There doesn't seem to be a way to set my Google account to use a different name for certain sites (or if there is, I'm not aware of it), and I want the articles on my own site to say "posted by James," not "posted by James1347" or whatever. Oh well. We seem to be keeping the confusion to a minimum. Hopefully. Randall Cunningham punted semi-regularly, including 80 and 91 yarders. To combine the thoughts in (occasional) James' and Ian Simcox's posts, if the short yardage kicker is any sort of athlete and the QB is the holder, the offense can align in regular 4th down personnel (except for longsnapper) with the "kicker" at WR, and the QB can decide whether to go for the conversion or shift to placekick mode. The flexibility, the practice cost to the defense, and the possible savings of a roster spot (if the team would otherwise carry two kickers) makes it sound worth a try to me. As a possibly tangential thought, a lot of this kind of thinking is common at the Varsity level, where kickers are inconsistent at best. When I was coaching HS, our placekicker was a FS/QB/100 meter champ who longsnapped for punts because the defense was not allowed to use a head up nose to block him from racing downfield to cover, while our punter was a TE/LB who longsnapped for placekicks (yep, the two players longsnapped to each other). We got a lot of miles out of fake punts and "swinging gate" 2pt plays, because our best players were handling the ball. "One idea from rugby that I've always liked is that the player who scores the TD is the one who has to kick the XP." Yeah, in Rugby Union there is a kicker, usually the fly half. The conversion is taken from a line drawn directly from the point of the touch so if they guy dives for the cones then the conversion angle is from the sideline. In HS, there was a team that had their QB literally under center on punts, with the punter his normal distance back. The QB would survey the defense and if he liked it, they would snap it and he'd run/throw it. If not, he'd literally stand up and have the long snapper snap it through his legs to the punter. Dangerous to defend against on 4th and short, but probably hurts their blocking scheme on punts. It seems to me that the guy most likely to fit the backup kicker role is the punter, especially given what we see in college (with many examples of players in both P and K roles). Suh may have the leg, but he's obviously not going to be spending much time in practice on kicking (nor do you really want your star rookie DT swinging his legs like that if necessary - after all, Hanson got hurt during a FG attempt). My impression is that the kickers have a bit more time for things like practicing placekicks. Harris doesn't have that background, though; he was a punter-only at Cal and doesn't seem to have kicked at all in the NFL. 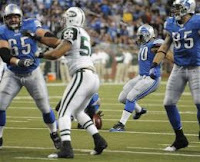 The Lions seem to be about average with respect to plays that would resemble two-point attempts. I would guess that a team with solid red-zone targets like Calvin Johnson and Brandon Pettigrew might have success on those attempts, but Revis was defending Johnson well that game ... I can definitely imagine Schwartz estimating a low probability of a successful two-point try at that time. Team A is down 18 points with 7 minutes to go in the game. They score a TD to cut it to 12. Should they go for 2 or 1 here?